Perhaps some of you might remember my blog on MO Baxter organic grass fertilizer and moss killer in the spring. It was advertised on a Scottish gardening programme as a great new product with a bacteria that ate the dead moss so that no scarifying was needed. Sounded great to me!!! It was expensive….over £40.00 a bag. My grass looks really great, green, thick and healthy. The moss persists and the weeds were not included in the treatment, so they had to be treated separately. I was spared the dreaded scarifying and had no blackening of moss. It reduced the moss quite a bit, but not completely. I will wait and see if the grass gets off to a good start in the spring, but I don’t think I will buy it again. If it was cheaper I might have. Your lawn looks really good, didn't see the before pics. Hope the spring brings good results, my little postage stamp of a lawn is all clover. My lawn, appart from being 4" long (again) and wet is full of buttercup!! I have also found some self seeded chamomile growing in it!! Your lawn looks absolutely beautiful. I call mine grass and it is used by a fox as her toilet. I am very upset about it and cannot think of any solution. 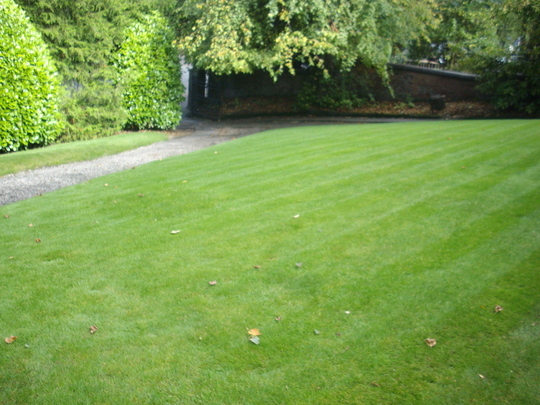 Beautiful lawn Linda....a bit expensive though eh? Grass looks well but have to say it was expensive. It seems to have won an award for best new product and it is very safe for animals. It is now £35.00 for 20kg, but it is still expensive. Scottish viewers will know of the TV programme Beechgrove Garden. They did a trial but had little success. I think temperature is an issue. How much of the 20kgs did you use on this lawn? and does it have a use by date? I bought it in the spring and have used all of it. I have a lot of grass.... could have used more!!!! I think I treated the grass about thee times. I don't have the bag I'm afraid I binned it recently.